I am so tired of walking into my kitchen and finding jackets and backpacks all over the floor. About a year ago, we installed a shelving unit from Pottery Barn in one corner of the kitchen, and it's done a pretty good job of collecting shoes and papers ... with the occasional week when we fall off the wagon. But it doesn't have hooks. And I desperately needed hooks. Luckily, I received a few Pottery Barn gift cards for Christmas, and I found a set of hooks that is perfect for our family. I ordered them in the "1," "2" and "3" designations, and on Sunday afternoon I hung them up ... one for each boy. They look like they're not exactly equidistant. Which is possible. But we're going to ignore that for now. Let's focus instead on the ginormous clock that hopefully will help us get out the door on time. The one in which I inserted a new battery after it had been telling us the wrong time since about March. I briefly considered cleaning up the black cabinet before I took this picture, but then I decided that would be like lying. Several days a month it looks really nice. But most days it looks more like this. It's just the nature of the beast. I LOVE the hooks. I love that there's one for each of the boys, and I love that they look so vintage. I also love what they represent: organization and cleanliness. Of course, in my head, I thought that Nathaniel would take 1, Nick would take 2, and Jake would take 3, in birth order. 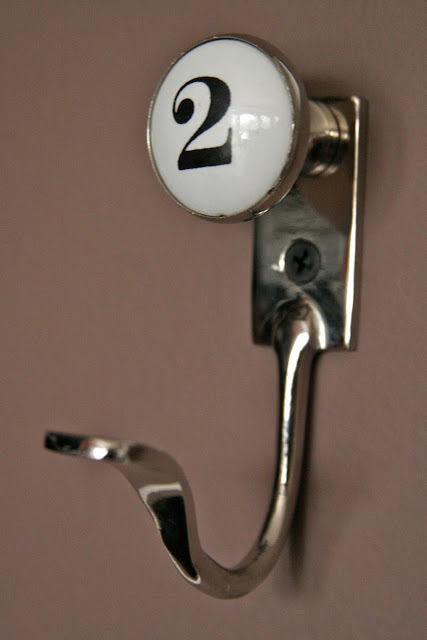 But Jakey is making a STRONG, LOUD case to use the 2 hook, because he is 2! And he wants us to know it! And that only makes sense! But for now, he's taking 3. That should last for approximately one day. And then the whining will win. I'll be okay with that. I'm just so glad not to be tripping over a backpack or a jacket today, they can have whichever number they darn well please. We've been trying to get the organization thing going on here. Our tiny house is about to explode. What a lovely find! Your new hooks are fantastic! Gives me a good idea for my girls bedroom!!! My son was peeking over my shoulder as I read this. His thughts? "Nice clock. AND nice backpacks!" I wish I could get my entry area to look like this! 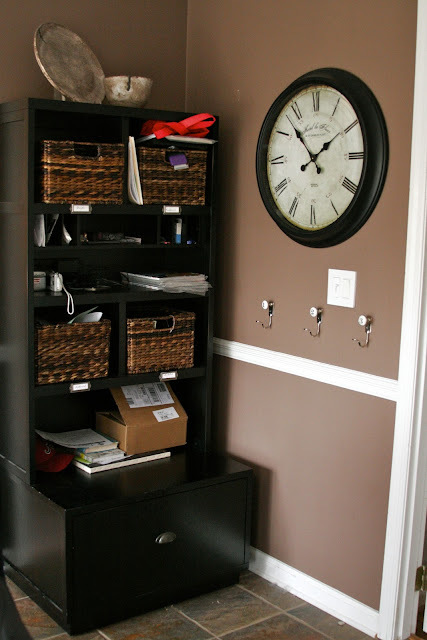 FYI - The Good Stuff Guide is also discussing entryways/mudrooms today. Love the clock. 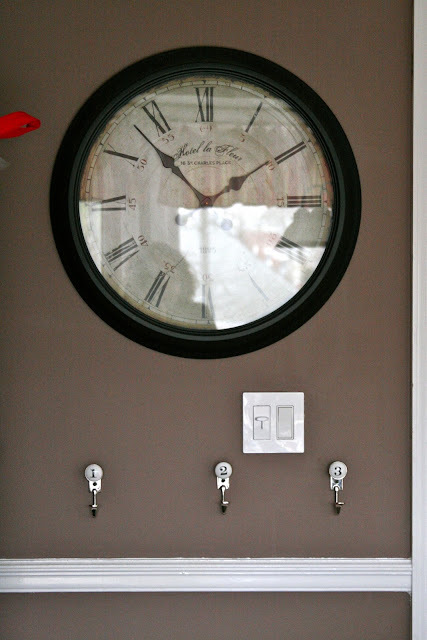 I was going to get one for our sunroom, but decided that I didn't want to know what time it is when I am out there! Love the hooks. Need one for hubby! Wondering where I keep my coat/jacket? Back seat of the van. I never drive with it on and only need it when I have to walk a mile if stranded! I was taught to be prepared. I also have window cleaner, blanket, pillow, Diet Coke, Extra Strength Tylenol and hairspray! I'm glad you guys like the hooks; I'm loving them. 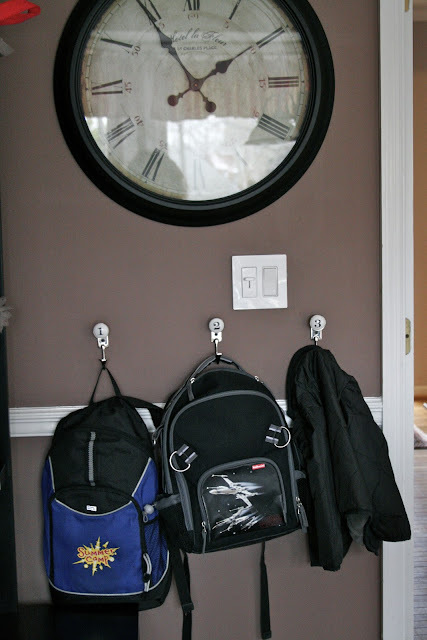 One thing I've discovered this week is that to hold backpacks reliably, they need to be anchored into the sheetrock. I will probably take them out this weekend and reinstall them with anchors. No biggie ... I thought I could get away without them, but I'm now thinking that I can't.